"DONALD TRUMP TWEETED AN ATTACK ON AN MSNBC ANCHOR'S APPEARANCE," SAID CHRISTOPHER ROBIN. "PEOPLE ARE CALLING IT BENEATH THE OFFICE OF THE PRESIDENT TO DO THIS. 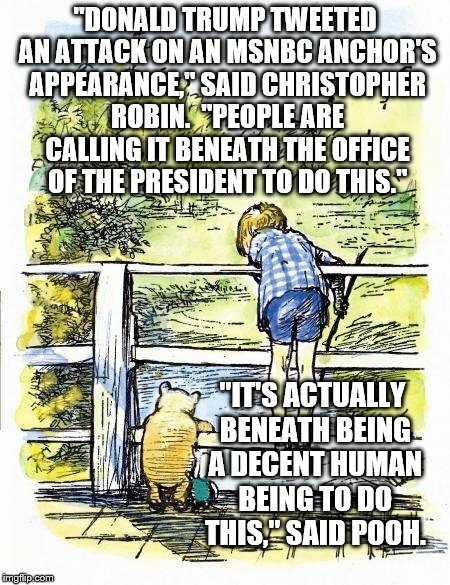 "; "IT'S ACTUALLY BENEATH BEING A DECENT HUMAN BEING TO DO THIS," SAID POOH.